Dark Justice: Dominion follows on directly from Judge Dredd: Dark Justice, from the pages of 2000AD. That story reached its downbeat ending with Judge Death and his pals Judge Fire and Judge Mortis floating in space, cast adrift in the infinite void. A common problem for your superhero-type is the role of the recurring villain. Whilst Batman, with his liberal, politically-correct refusal to murder anyone* has caused the issue of the same batch of villains repeatedly returning, the writers of Judge Dredd hit upon a different problem: Dredd shoots everyone. The very first, unpublished, Dredd story had him execute a citizen for jay-walking. So, how do you build a returning bad guy? Easy...you make him already dead. Judge Death is a reality-hopping super zombie who genocided everyone in his own world before stumbling upon trans-dimensional technology and deciding to spread the good word. He appeared several times in classic Dredd stories, together with his buddies, the Dark Judges. Over time the character changed, morphing from a Hammer Horror style villain to an uber-camp rockstar-Joker, and genocidal pantomime villain. Recent years have seen the Dark Judges not just return to their morbid roots, but become darker and more unsettling than ever before. Most notably in the Deadworld saga, which examines their development fom men into the monsters they became. 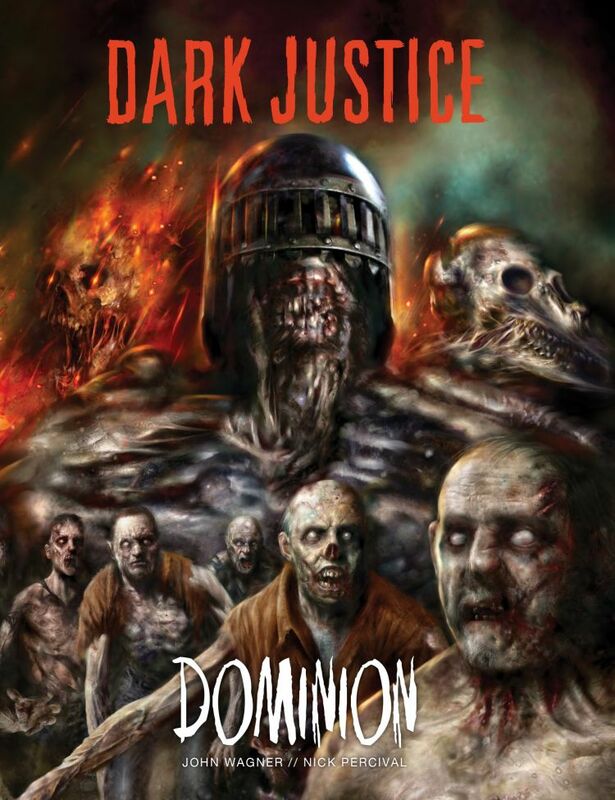 In Dark Justice: Dominion, the terrible trio find their way to the off-world colony of Dominion, where they set about murdering the inhabitants amid a constant blizzard. In terms of story, it feels like a selection of sci-fi/horror movie tropes. We have sleep pods, and the main character walking up after a disaster. There are suspicious pod-people, and a "last girl". There are last survivors holed-up in a final refuge surrounded by the undead. There's even a group of people covering themselves in zombie guts, to disguise themselves from the drooling herd - a scene now required by law in all zombie fiction. Dominion regurgitates the entire horror genre. It does it very well, but there’s not much new. Nick Percival’s Dark Judges are gangly, awful things. They’re bits of rotting people, but somehow manage to have full uniforms. Whereas Dave Kendall's art for Deadworld was the colour of infected sores and rust, Dominion is gaping wounds and raw flesh. His Judges looks horrible...in a good way. Elsewhere, the art vears between very unclear and photorealistic. Dark Justice: Dominion is a decent, if uninspired tale. The only question I found myself asking was "how will the Dark Judges get back to Earth, where they can terrorise characters I actually care about". With the story continuing recently as The Torture Garden in Judge Dredd Megazine, don't expect any answers quite yet.